The Thompson brothers, Phil and Simon, proprietors of the Dornoch Castle Hotel Bar and new distillers operating the Dornoch Distillery, have in their various travels and searching, acquired three examples of old Scotch Whisky drawn from cask many years ago and stored away in carboys or flagons only to be unearthed many years later, be it estate sales or auctions. 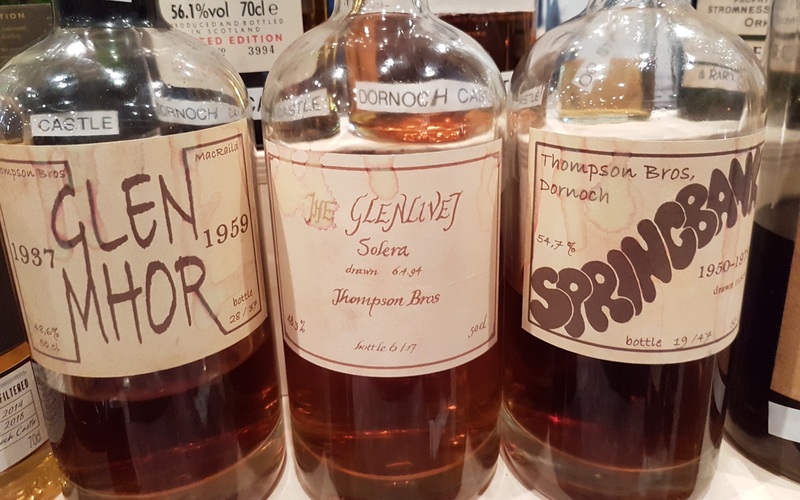 They have now bottled these truly unique whiskies and made them available for tasting at the Limburg Whiskyfair 2018. I am very pleased to be able to try them together. They are absolutely something to write home about. This is old Glenlivet though we can only guess at the vintages. The previous owner put this into solera (imagine you had a cask of Glenlivet back in the day, and for every bottle you drew, you replaced with the Glenlivet of the time) and many years later drawn from cask in 1994 and then stored away in a cellar. The Thompsons subsequently acquired and bottled the whisky. Impressions again, because it was rather wild that night: It’s definitely old, a lighter more elegant style of Glenlivet and not a heavy overflowing style. More aromatics and poise than muscularity. Some glass too, but also dry leather, tobacco, light butter on glazed pastry, dried up blackberry jam. Old cardboard. ‘Light’ aniseed if that makes sense, and clean camphor and earth, without the heavy funk it sometimes comes with. Just a touch of medicine. Palate is much in line. Maybe leaning towards more ink, furniture polish, a host of dry purples. Some runny honey, dark mollasses or is that treacle. Quite some wet leather, and now a bit of that old earthy funky notes like dried out mud or cold BBQ. Not heavy but somewhat dusty too. Similar to the Glenlivet above, but here a meticulous record evidences the input vintages for posterity. The owner eventually emptied his little cask into glass, and then it was sold onwards to the Thompsons. Impressions: Right definitely bigger and more beefy. A more immediate richness but it is certainly itself a big boned old Spingbank with lots of earthy dirtiness, that’s moist black earth… and also some flints, hints of smoke, salt air. Bung cloth, and dampness. A flood of dried fruit, and a host of other little dry sherry aromatics abound. Palate is rather huge, with lots of earthiness and wispy smoke, as well as a very noticeable menthol plus peppercorns sort of heat. Ancient salves, dried mint sprigs. Big but very high quality dry sherry notes again… Tobacco and class. This one was distilled in 1937 and bottled into a huge stone flagon (not sure what the appropriate name is for stoneware of such and such a capacity but anyhow…) and the acquired by the very resourceful Thompsons again. Impressions: Immense truly immense even at this lower abv. Dripping with black treacle and molasses over sticky date pudding slathered in fig jam, then a mountain of shaved 70% Ecuador on top maybe… OK, look it’s huge and sweet and rich. Despite that, this gloved fist of a Glen Mhor can be felt under that richness. A firm iron backbone cast from a thick ‘funky but not funky’ vegetal buzz. Seems peculiar to old Glen Mhor? Nestled in fresh pulled roots with moist earth still attached. Extraordinary depth, and also richness that doesn’t fall apart at all. Palate: Again huge, rich and sweet, with purple fruit and other waxy garden fruit, but also an oily thick mouthfeel. Vegetal buzz again, hints of black char and forgotten wood. Maybe bags of charcoal, and dank earth, hints of farm? 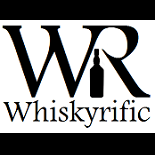 This entry was posted on May 15, 2018 by Whiskyrific in Glen Mhor, Glenlivet, Springbank and tagged brothers, Glen Mhor, Glenlivet, Springbank, Thompson.